On Saturday, October 15 I ran my 4th marathon. I first signed up to do this race two years ago but due to some back issues I decided not to run the race. Fast forward two years later and I can finally cross it off my list. I took the day off from work on Friday and was on the 6am flight to Hartford. There was a stop on Baltimore but I still managed to get in at a very decent time. A friend picked me up at the airport and then dropped me off at the Hilton Hotel. The XL Center (to pick up packet) was right next to the hotel so I was very happy about that. I got chills when I got to XL Center. So many people there! I was not impressed with the expo. I guess I like the Chicago Marathon expo a lot and compared it to that. Oh well. I bought a few things that I “needed” and met Dane Rauschenberg. 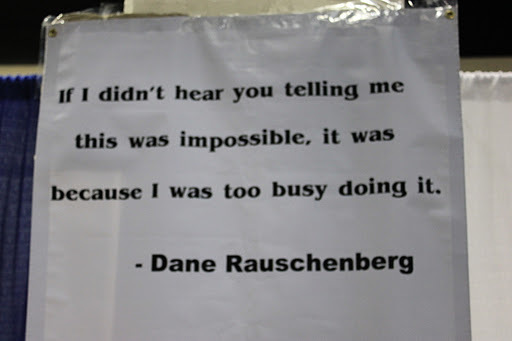 On the wall was an interesting quote “If I didn’t hear you telling me this was impossible, it was because I was too busy doing it.” Definitely motivated me. After the expo I met some friends at work and waited there till it was time to go to dinner. We went to Bertucci’s. I had some rigatoni with marinara sauce. Very simple dinner. My friends had some eggplant dish and chicken piccata. Looked so good but I was still happy with my food. I was having a great time with them that I was sad when it was time to go. However, I knew I had to get a good night sleep and rest up before the race. I went back to the hotel, got my things ready, and was asleep by around 9:30pm. Race morning I was up at 6:30am. I got ready and ate a peanut butter and jelly sandwich. My friend’s daughter had made them for me. So nice of them!!! Once I was ready, off I went to Bushnell Park which was about a 5 minute walk. Lots of people there. I could feel the energy and the excitement. It was a gorgeous morning for a race! My plan was to finish the race in 5 hours. That is about an 11:30 minute pace. No problem. Well, at least I thought so. I joined a group to ensure I finish the race in 5 hours. However, I did not know that the pacer was doing a run/walk method. She was running at about a 10:00 minute pace and then walking to “make up” the difference. I ran with the group for a few miles but could not keep up with them. Darn!!! I was annoyed because I did not know she would be running at a faster pace. I made it to the halfway point in 2:30:30 (11:30 pace). Then it went downhill. I got to mile 20 in 4:00:00 (12:02 pace) and finish line in 5:25:21(12:25 pace). So what happened? Well, being from Chicago I am used to running in flat ground. Hartford had inclines. Many of them. More than I am used to. Also, the turnaround point was a little before mile 17 and from then on it was WINDY. I know I live in the “Windy City” but I do not run 9 miles in the wind. Ugh!!! I felt some pain in my quads and took an ibuprofen around mile 17 to take care of that problem. I had minor foot and hip pain but not enough for me to walk. Overall, I felt good. It was the wind that made me walk (I know, excuses, excuses). I wanted to cry. The marathon gods were not being nice. I should have been glad that it was windy instead of rainy. According to my friends I got lucky because it had been raining for a few days in Hartford. It was raining when I got in Friday morning!! Overall, the ING Hartford Marathon is a great race! It took me about 4 minutes to get to the start line versus 30 minutes in the Chicago Marathon. It was a very scenic route that went through several towns near Hartford. Along the way there was more crowd support than I expected. There were volunteers in bikes passing out GU. They were also encouraging the runners but at one point I wanted to tell him to just be quiet. He was all cheerful riding a bike while I was struggling to get to the finish line. Did I mention the inclines? I should have paid more attention to the elevation map and trained better. The best part of the race was the finish line. 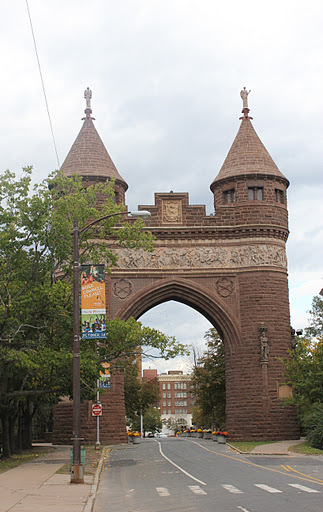 All runners passed through the Soldiers and Sailors Arch, a monument to honor the 4,000 Hartford citizens who served in the Civil War, and the 400 who died for the Union. Beautiful!!! I am very glad I did this race. I got a PR! Yay!!! Next year I would like to run the New Orleans Marathon. According to the website the course is flat. Yeah right! We’ll see about that. The plan for now is to rest. I have a well deserved massage scheduled for Thursday and am looking forward to it. I plan to do the Carrera de los Muertos 5K on October 29 and am debating about the Trick or Treat 5K/10K the next day. Then it is back to 18 weeks of training for another marathon. Yes, New Orleans IS flat. I can promise you that. Great job on your race. I'm glad you enjoyed the scenery on the course, too. Recover well! GREAT Marathon! You did awesome! I would LOVE to run New Orleans someday! Congrats on finishing your fourth marathon and getting the PR. I always stare intently at elevation charts because I know I'm weaker on hills. Luckily, I can do a lot of hill training where I live.Hope the next one goes better. Congrats! It is definitely tough with hills and inclines when you aren't used to it. I was registered for Hartford once, but got the Swine flu and couldnt run it. So I knda just lived vicariously through you. Hope your recovery goes well! Congrats on the PR! 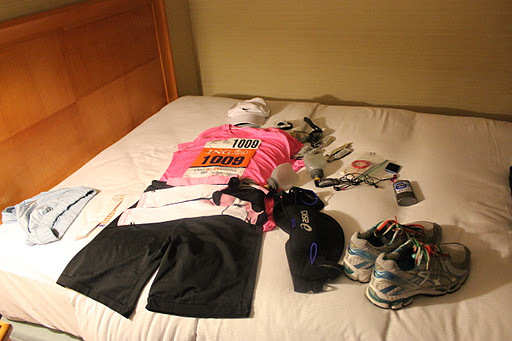 My last marathon was rainy – I think wind is worse than rain! Great job!